Product branding ideas for the hospitality industry for giveaways and building brand loyalty. As a hotel or a resort, it’s important to make a lasting and positive impression on your customers during their stay. But how can you capitalize on that? What’s the best way to make sure that a service that might only be used once a year gets remembered? And, what can you do to ensure that your guests keep remembering the good times they had with you? Promotional Products for hotels are an excellent way to guarantee that your customers aren’t going to forget you anytime soon. They are a great method of developing and maintaining customer loyalty, especially if you’re not providing an every-day service or product. Hotels and resorts can make residents feel valued by providing hotel giveaway items like Spa Kits and Towels, but the potential of Promotional Products for resorts and hotels, in terms of reinforcing customer loyalty, goes way beyond shampoo. The truth is, there are a massive range of hotel promotional products available, designed to be used every day. Such items not only keep great memories alive and well in the minds of your customers, they can also get your brand or your logo to places your advertising can’t. Vacations and travel are one of the best things in life. Most of us work forty-eight weeks of the year. The times we spend with friends and family on vacation often form some of our most treasured memories. Reinforcing memories like that – and connecting them to your brand, is a priceless form of promotion. It’s also a great way to keep your customers coming back. Hotel promotional products not only remind a customer of your great service, they can also provide easy access to your contact details for when the time comes to re-book. Including your web address and phone number on a promotional item will mean you’re already ahead of the competition. Hotel giveaway items are also a surprisingly customer-friendly form of advertising. A recent study by the Advertising Specialty Institute found that consumers are 2.5 times more likely to have a positive opinion of an organization’s swag, than of its internet advertising. What’s more, promotional items like T-shirts and Tote Bags return thousands of impressions during their usable life. They turn your customer into a walking advertisement for your resort or hotel, at the same time as encouraging loyalty. The BPMA found in a study, that 79% of recipients of a promotional item would be likely to deal with the business again. In the US, the ASI also found that 87% of people kept promotional products for more than a year. Combine that statistic with an item featuring your contact details and that’s a fine marketing tool for any hotel or resort when vacation time comes around. So, let’s take a look at the top 10 promotional products for hotels and resorts in 2019. The best promotional products you can have as a hotel or resort comes in the form of personal care items such as face and body products. You are already supplying them with these items anyways, so why not brand them to include your name and logo? Many people keep these products when the leave your hotel. It is a great way for them to remember you when they use the product once they get back home. They may even want to book another stay when using the product brings back memories of their trip. It’s hard to get past the t-shirt when it comes to exposing your brand to the world outside your existing customer base. And everyone loves a free t-shirt. They’re one of the most versatile items of clothing and almost everybody wears them. A t-shirt with your hotel information on it will not only serve as a useful item of clothing to wear by your pool. It will likely go into the rotation at home as well. T-shirts have the size and scope for any type of branding and are one of the most versatile hotel giveaway items. One of the best hotel promotional products has got to be the calendar. In the United States, 21% of consumers own a promotional calendar. As a branding tool, they are a great way to make sure your customer can’t forget you. Calendars are where people cross off the days until our next vacation and as such are the ideal place to put your logo and contact details. Could there be any better marketing tool for a hotel or a resort? An umbrella reminds your customer of the sunshine and the laughter of their vacation with you – every time it pours with rain. Having the name of your hotel on a promotional product is one thing, but putting it on a complimentary umbrella might just be the stuff of genius. Be sure it’s you that they think of the next time the heavens open. Gift them an umbrella the next time they stay. Not only may it protect them from the odd tropical downpour on their vacation, it’ll also keep them wishing they were back with you throughout the rest of the year. And let’s face it, an umbrella is a pretty useful gift for most of us to receive. Don’t forget that umbrellas are also used to shield from the sun. Giving an umbrella away for guests to take home AND use on their stay goes a long way for customer satisfaction. One promotional product likely to keep customers coming back for several years is the humble mug. One of the more useful gifts to get, mugs are very effective at promoting a business or service. Most winter days start with a coffee, so make each coffee serve as a reminder of warmer climes and happier times, by giving them a mug with your logo on it next time they visit. Make them remember why they came to you in the first place as they are starring out the window at all the snow back home. Don’t forget about other drinkware items such as tumblers and water bottles. People using these when working out at home may just think they are ready for the next vacation. You can never own too many pair of sunglasses. It’s the only way to effectively ensure that you can find a pair when you need one. Most folks keep a pair in the car, a pair in the office and a pair literally everywhere. Nobody won’t thank you for an extra pair of sunglasses and they’re one of the most logical promotional products for hotels and resorts. While your guest is still on vacation, or when they’ve gone back home, you’ll be giving a gift that just keeps on giving. Add your hotel name on one side and your web address and number on the other. The only thing shining through will be your marketing strategy. Promotional hats come in all shapes and sizes and are a walking billboard for your brand. They’re made for all weathers and activities. There’s a hat to suit every hotel or resort and they’re a useful gift to get for anyone. Nothing says customer loyalty or conveys the idea of a good consumer experience like a well-worn hat with a business logo. And that’s a great signal to send to the wider world. So, use your head, and give them all a hat. As promotional apparel goes, the fleece is an extremely useful item of clothing. Nearly everyone has a go-to fleece for when the evenings get chilly in the Summer (or for when the winter sets in). A fleece can be one of the more thoughtful hotel promotional products to give. Nothing creates good felling quite like something comfortable and cozy to slip on after the sun goes down. You can be sure that your guest will place value on a fleece and that it’ll be a great practical item when they get home. If you don’t want to give these away as a gift, you can simply sell them in your gift shop. Even selling them at cost will give you a return on your money since people will be promoting you when wearing it. We’ve all been there. Travel, mobile phones and technology don’t mix too well. Charging on the move can make for problems, and vacations are when we want to be using our phone cameras and capturing memories the most. Promotional Power Banks are really useful gadgets year-round as well. As such, they make a great gift to a customer and great promotional products for resorts. Consider giving your guests a power bank when they check in. It’s something they’re likely to carry around constantly when they get home, and it’s a great reminder of their stay. It is also appreciated as they more than likely forgot to bring one with them. Tote bags rank as the best promotional item in terms of impressions. As stores everywhere discontinue the use of plastic bags, tote bags have become a symbol of eco-friendly behavior. And they’ve also become one of the most useful, practical items in any household. The way people use tote bags to shop means that they get seen – a lot. And that means your logo gets seen too. 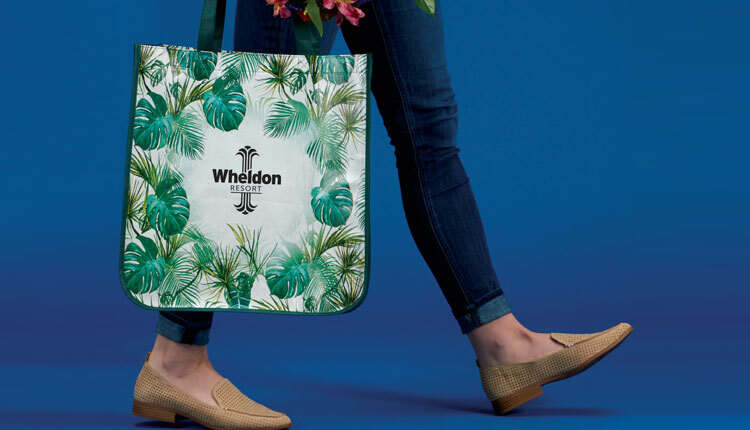 Not only will a tote bag be great for the beach on their stay with you, but a tote bag will be taken home and used by your guest most days of the week. So, why not put together a welcome pack of freebies for your guests, and present them in a tote bag? It’s a tactic that’s sure to create instant goodwill, and very likely to produce a return visit. That work-weary man or woman who rises on a cold morning will take solace when drinking coffee from a mug emblazoned with the logo of your hotel. That’s a hotel which holds good memories for them. And that’s a mug which offers the promise of their next vacation too. According to PPAI, 62% of Americans remember the name and the details of a company that gifted them a promotional product. This is a great opportunity for resorts and hotels. Promotional products offer a great way to keep your brand in the minds of guests, and to remind them to keep returning. The ten products above are by no means a list of all that’s available and we can supply a high-quality product to suit any budget or any creative marketing idea. So, give us a call today and start making promotional swag work for your hotel or resort. We’re always here and we’re always happy to help.